I mostly just wanted to draw Ence as a samurai. This entry was posted on Monday, December 19th, 2011 at 12:00 am and is filed under Comics. You can follow any responses to this entry through the RSS 2.0 feed. Both comments and pings are currently closed. Katanas are ALWAYS the right tool. ALWAYS. 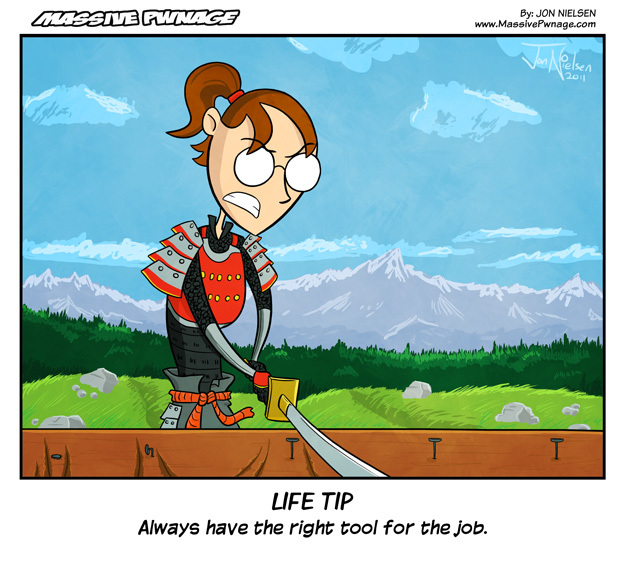 I thought of the katana as a hammer thing too, just reading the “life tip” part. And katana’s work for everything except a hammer, but who needs to build anything when you’ve got a friggen katana? It would only be worse if they were screws. Actually, you could use the blade of the Katana as a screwdriver. Depending on what type of screw it is, you’ll have to orient the blade in different ways, but there aren’t many types of screws you couldn’t use a Katana for. Or, as previously suggested, threaten someone with a proper screwdriver to do it using the Katana. I think we’ve inadvertently discovered that a Katana is indeed the best possible tool. 1. Use the hilt instead of the blade. 2. Threaten someone who has a hammer with the sword.